Home improvement store coupons are always welcome in our house and here’s one for Home Depot. 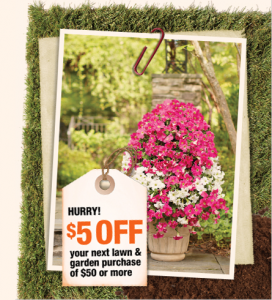 Get $5 off any Home & Garden purchase of $50 or more when you sign up for their email newsletter. The Home Depot newsletter is also a great way to get Home Depot coupons later on and you never know when they’ll send you one. Aside from moving, it’s one of the best ways to get their coupons!